Today, waterjets are the preferred propulsion choice for a wide range of pleasure and commercial craft where high efficiency, outstanding manoeuvrability, shallow draft capability and low maintenance are key requirements. With over 30,000 installations over the last 46 years, Hamilton Jet has a world of experience. 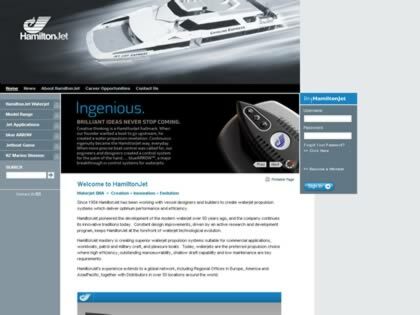 Web Site Snapshot: If available, above is a snapshot of the Hamilton Jet web site at http://www.hamjet.co.nz/ as it appeared when this site was added to the directory or last verified. Please Note that Boat Design Net has no involvement with the above web site; all content and images depicted in the above thumbnail are the property and copyright of Hamilton Jet unless otherwise noted on that site. Description: Today, waterjets are the preferred propulsion choice for a wide range of pleasure and commercial craft where high efficiency, outstanding manoeuvrability, shallow draft capability and low maintenance are key requirements. With over 30,000 installations over the last 46 years, Hamilton Jet has a world of experience.